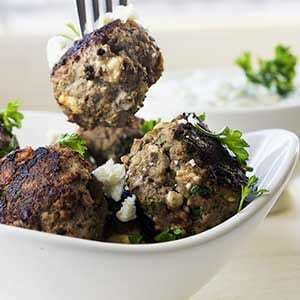 These delicious Bison Meatballs are packed with Mediterranean flavors inspired by our many trips to Greece. They are easy to cook and great to take along with you when you are on the go (and you don’t even need utensils to eat them!). I started using bison in a lot of different recipes after we moved to the United States. At first, it was because I couldn’t get any lean beef, but now I actually think that bison is tastier and juicier than regular beef. It’s also higher in protein, super lean, and guaranteed free of growth hormones and all the other nasty stuff you sometimes find in non-organic beef. Give it a try if you can get it! The flavor of these bison meatballs takes me back to eating gyros (also know as kebab or kabob) in Greece. In my opinion, Greece has some of the best street food of any country, and you can get delicious lamb or beef gyros with tzatziki everywhere. To get that authentic Greek flavor, I added a little feta to the meatballs. The feta only adds a tiny bit of flavor, but it also adds a ton of juiciness. Even if you don’t normally like feta (my husband doesn’t), try this recipe. You won’t be disappointed! I also made a very simple tzatziki dressing. You only need three ingredients: plain Greek yogurt, cucumber, and garlic. Grate the cucumber and dry the grated pieces thoroughly with kitchen towels to get rid of most of the water. Then add the cucumber and pressed garlic to the yogurt and let it sit in the fridge for a few hours. It’s as easy as that! If you don’t have Greek Yogurt, you can use regular plain yogurt instead. Just put it in a coffee filter or cheesecloth for an hour or so first to drain some of the water out. The perfect way to serve these bison meatballs would be in pita bread with salad and the tzatziki, but I made a little rice cooked in chicken bouillon and turmeric instead. It worked great too. If you can’t get hold of bison but really want some delicious and healthy meatballs, try my Turkey Meatballs instead. They are equally healthy and tasty! 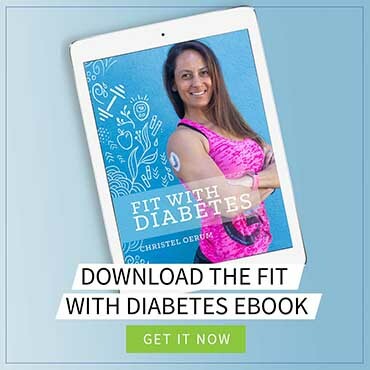 You can also check out my roundup of the best healthy low-carb dinner recipes for more recipe inspiration. 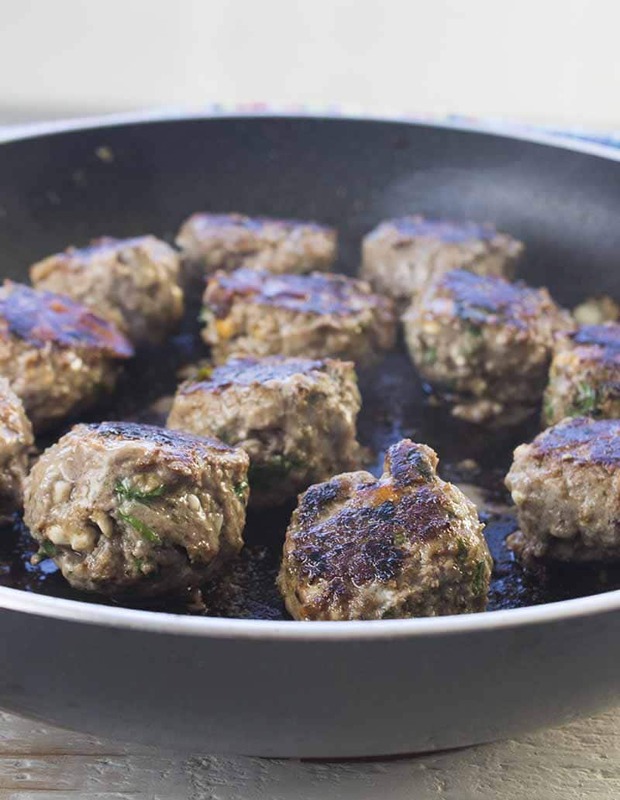 When you’ve tried this bison meatball recipe, please don’t forget to let me know how you liked it and rate the recipe in the comments below! 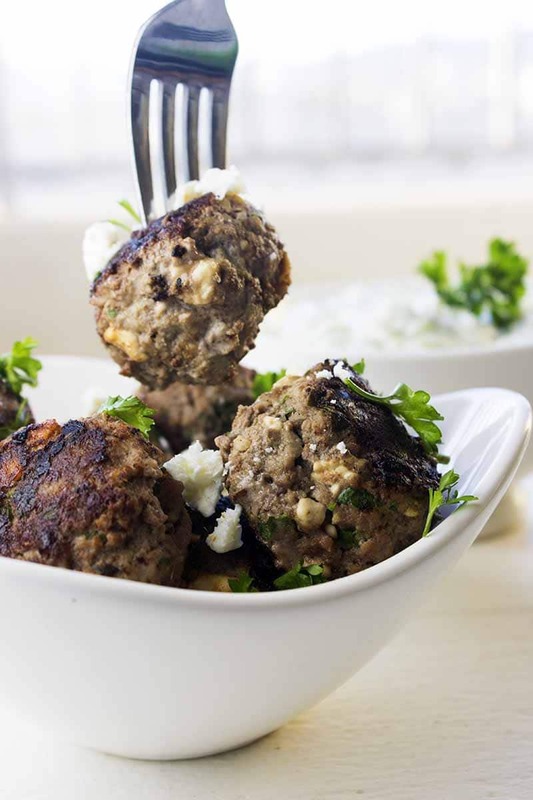 These delicious Bison Meatballs are packed with Mediterranean flavors inspired by our many trips to Greece. Put the ground bison in a mixing bowl. Press or finely chop the garlic and mix into the bison. Add the egg and spices. When the bison, egg, and spices are well combined, add the feta and fold it in carefully. Roll the bison mix into 10 golf ball sized meatballs. Add a little cooking spray to a large skillet and place on medium heat. When the pan is hot, add the meatballs and cook for about 7 minutes, turning them regularly. Serve with tzatziki, salad, and pita bread or rice. Enjoy! Great recipe. I have already made it twice.